Ever admired Sandra Bullock, Gwyneth Paltrow or Kelly Ripa’s famous figures? All of these ladies do dance cardio to get their best bodies. We took some the most popular classes and got the trainers to spill tips and tricks so you can dance yourself thin, too. The Tracy Anderson method, Body by Simone and AKTInMotion are some of New York City’s most popular dance cardio classes. We tried them all to learn how dancing up a storm can torch major calories and sculpt a long and lean body. 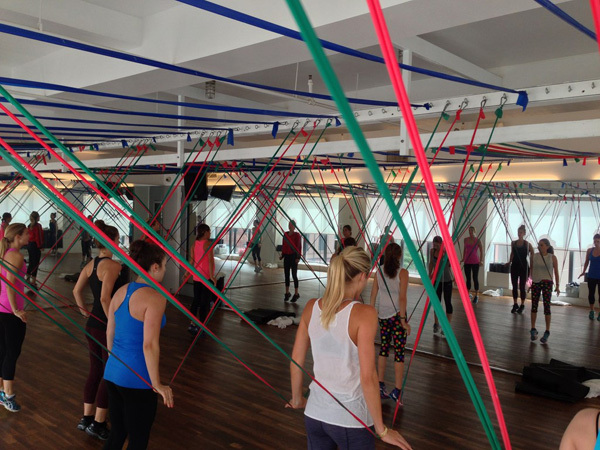 During the MultiTAsk Band class, which they recommend for a newbie like myself, we used resistance bands attached to the ceiling throughout the entire class, as we did dance moves, squats, lunges and more in a room heated to 86 degrees. The moves were easy to follow even for a first-timer, but still challenging. Toward the end of the class, there’s a floor routine with a mat that also uses the bands. I felt like the bands really added an extra intensity to my workout and I was totally soaked in sweat at the conclusion of the workout. Tracy recommends taking class six times a week to see maximum results. At AKTInMotion, where Kelly Ripa is a regular, new students start with a 60-minute AKTease class, where instructors teach you dance steps and incorporate body work with free weights, medicine balls and more for a full-body workout. As you progress and learn the steps, you move up to classes with more advanced choreography and dance routines that change every two weeks. During the class I took with Simone herself, the energetic Aussie led the group in high-energy choreographed routines that got my heart pumping as I tried to keep up with the more advanced students, who knew all the moves already. This one was the hardest for me to follow. If you’re not in NYC, all of the ladies offer online versions of their workouts and/or DVDs you can do right at home. And by doing dance cardio regularly, not only will you get into your skinny jeans but you’ll have some new moves to show off the next time you hit the dance floor, too!